On the eve of the Passover feast, Christ, the Lamb of God, shared a last supper with His disciples. One of them would betray Him. Before dawn, the others would desert Him and one of them—Peter, the Rock—would deny Him. Only when we understand and appropriate fully how radically New this Covenant is compared to the Old Covenant can we give Him our whole hearts! Only in the New Covenant power, sealed and administered by the Holy Spirit, can we walk by grace in this world, consumed with love for God and our neighbor. Spiritual “to do lists” and observances of Old Testament rules (our works, our efforts) distance us from Christ Himself. The New Covenant dispenses with everything that stands between you and God—including your own effort and works—and opens heaven! We are “complete in Him” new creatures in a new creation. We are not merely “sinners saved by grace”. We have received a full pardon and have been restored to the place in God’s family He intended from before the foundation of the world! We have been robed in the righteousness of Christ and seated at the feast table like the prodigal son. We have been given rings of sonship. and all the riches of our Father are opened to us—not in the “sweet by and by”, but now! We are assured a place at the wedding supper of the Lamb. 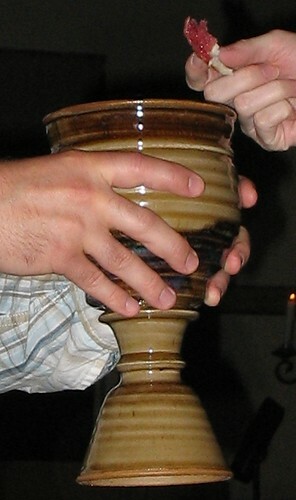 This is the significance of the cup of the New Covenant! Very good! The newness of the new covenant is missed by so many who seek a return to the shadows of the old. are we hearing the story of this woman? why not? is the gospel preached? are we preaching about Jesus? Is our messages focused on Jesus? or are we preaching more on morality? on the Laws? on commandments? on how to live your life? 12 steps? well, we have redefined the gospel by works. “I am not ashamed of the gospel, because it is the power of God for the salvation of everyone who believes: first for the Jew, then for the Gentile. the gospel reveals the Righteousness of God. I don’t have any rules regarding the length of a comment, beloved friend. Especially when we are in one accord, exalting the name of Christ above all names and giving thanks that He has set us free indeed! Thank you for sharing! Beautifully said, Leah! We are no longer law-keepers… but fruit-bearers! We don’t attempt to keep what is written on stone (which we can’t, anyway), but allow the Holy Spirit to produce the fruit that makes us look like Jesus. God bless, and great to hear from you, good friend!